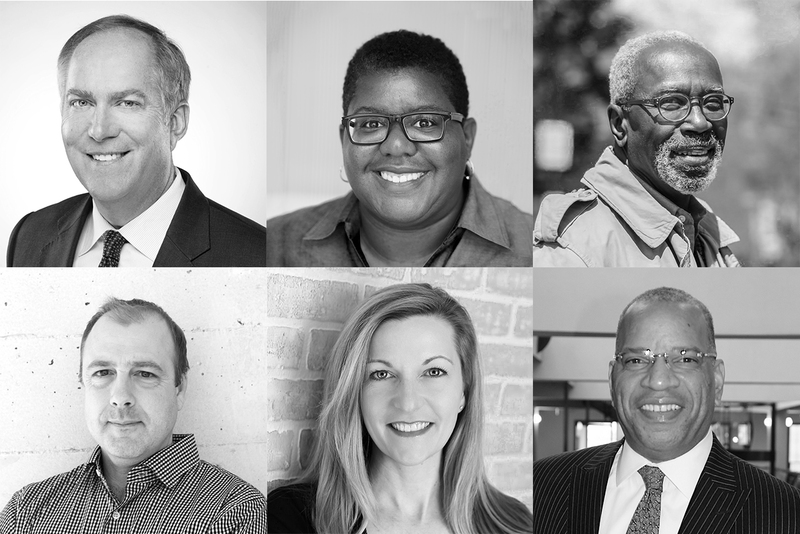 We’re excited to introduce the selection committee for the 2017 Rudy Bruner Award for Urban Excellence (RBA). They bring a diversity of experience and perspectives from their work in architecture, landscape architecture, planning, arts and culture, housing and community development, and philanthropy in cities across America. A new selection committee of six “urban experts” from the public and private sectors is assembled for each cycle of the RBA. Each committee is comprised of a mayor, a participant from a past winning project, and others with expertise in design and planning, development and financing, community engagement, and journalism. Clockwise from top left: Mayor Knox White, Kimberly Driggins, David Lee, Scot Spencer, Deidre Schmidt, Willet Moss. The committee will convene twice, first in Cambridge in February 3-5 to review all the submissions and to select five finalists and again on June 9-11 in Greenville, South Carolina to determine the gold medalist. In between, a team from the Bruner Foundation will visit the finalists to gather more information to inform their deliberations. We’ll post updates about the process beginning next February. In the meantime, visit our website to learn more about past and present committees and help spread the word about the 2017 Call for Entries.